Ever wonder why we carve pumpkins on Halloween? Why isn't the cartoon called, "It's The Great Turnip, Charlie Brown?" And, why is it called a Jack-o-lantern anyway? Scroll down to find out how the pumpkin carving tradition began. Enjoy! The jack-o-lantern is named after Jack, of course. He needed a lantern. Poor Jack he drank too much. His 18th century, Irish neighbors considered him a drunk and a miser, so they called him Stingy Jack. Apparently, Jack invited the devil over for a drink. He tricked the devil into paying (read more about this legend from TLC). Of course, the devil was angry and he vowed to come back for Jack. Various tales tell the story a bit differently, but it ends with Jack hallowing out a turnip, inserting a burning coal ember, and using it to light his way through HELL or to keep the devil at bay. Afterward, Irish families carved turnip lanterns to keep Jack's ghost away. Thus, the Jack-o-lantern was born. Once the Irish immigrants saw the pumpkin, they knew the larger veggie would be easier for Jack to see. Grab a grand pumpkin or turnip. Get a big carving knife, insert about 3" from the stem. It's difficult to cut, you must poke the knife in and wiggle it a little, pull it out, and then begin again until you've completed the circle. Once the top is removed you can begin cleaning your pumpkin. Just dive in with your hands and a large spoon and scoop the stringy goo and seeds out. Only pie pumpkins are edible, but the seeds of all pumpkins can be toasted for a yummy snack. Pumpkin Seeds waiting for roasting. At first, the turnip seems like it's impossible to carve, but practice makes perfect. Score a ring inside the top layer (from where you removed the lid) and use your knife or a sturdy spoon to scrape out the insides. Leave about a 1/4 inch ring of flesh. Turnip Jack-o-lanterns ready for candles. Draw a fun face or artsy, spooky picture onto the veggie. Insert Knife, pumpkin carving tool or even a screwdriver and cut. This is not fun- not for you, not for the littles. It's difficult, but once you've got a good slice going the piece will start to loosen. 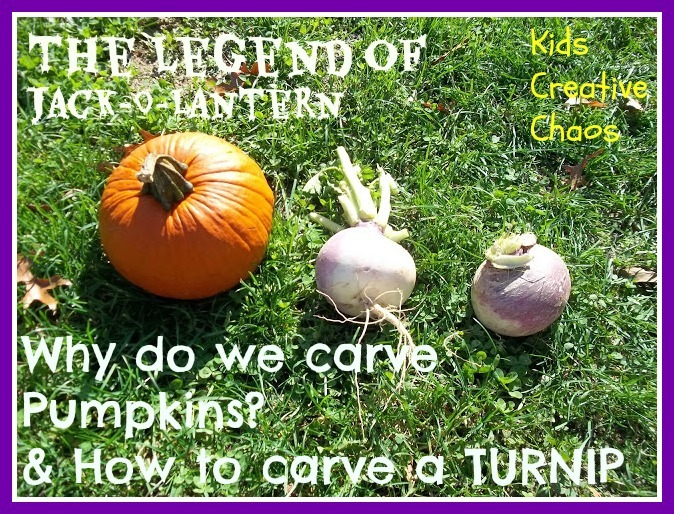 Let the littles place their hands inside the pumpkin/turnip and push out with their thumb. Oh what fun! It's like a little jigsaw puzzle. How to carve a pumpkin: Digging out pumpkin guts and seeds. Pumpkin clean inside and ready for a candle. Keep your pumpkin dry! If you keep it in the house it lasts longer. Pumpkin Preservation Experiment. We sprayed ours with vinegar then wiped the excess liquid and patted the rest dry (it didn't work). Glue and Petroleum Jelly are only myths- see the preservation link. Decorate gourds: Happy Meal Stickers. Pumpkin Decorating Supplies: Stickers from a Happy Meal, Carving ideas, Battery powered Votives from Dollar Tree. We like to decorate our pumpkins with stickers or felt to keep them thru Thanksgiving season. Don't believe me? 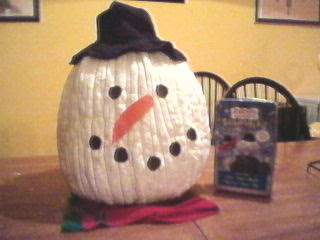 Here is our snow pumpkin we decorated for CHRISTMAS with our snowman kit. Decorate a pumpkin like a Snowman. Ahh... Halloween, I love you. A turnip does seem difficult to carve! I've never heard the story of where jack o' lanterns came from. Thanks for sharing! Thanks for reading :-) The turnip really reflects light. Ginny are you still doing Blog Frog daily? What adorable Halloween decorations! A turnip look really hard to carve. That's so interesting - I never knew those facts! I love the snowman pumpkin - it's fantastic it keeps that long! Oooh funny, someone else mentioned Halloween Turnips recently and we really wanted to give them a go. How fun that you did. Thanks for all the info. So bummed that I saw this after we used up our turnips. That would have been so fun to try! According to my Celtic studies professor, jack-o-lanterns go back way further than this story. The ancient Celts celebrated Samhain (now called Halloween) as the end of one year and the beginning of the next. On this night, the veil between the 2 worlds is the thinnest and the spirits of the dead can walk the earth. The jack-o-lantern was to scare away evil spirits and also light the way for loved ones.